After months of studying the grounds of Florida's largest reform school, a team of anthropologists identify 19 more graves suggesting more boys were allegedly tortured and killed there. WFLA's Yolanda Fernandez reports. Scientists have found 19 previously unknown grave shafts on the grounds of a notorious Florida reform school, suggesting that many more boys died there amid brutal conditions than had previously been known, the researchers said Monday. The Arthur G. Dozier School for Boys in Marianna, which was also known as the Florida State Reform School, closed in June 2011 after state investigators and the U.S. Justice Department's Civil Rights Division confirmed widespread abuse over many decades. The prominent writer Roger Dean Kiser, author of "The White House Boys — An American Tragedy," about the horrors he experienced while incarcerated there in the 1950s as a child, has called the school a "concentration camp for little boys." He wrote that "a devil was hiding behind every tree, every building and even behind every blade of manicured grass." They're called the White House Boys because much of the abuse occurred in an 11-room building on the school grounds known as the White House, where former students say they were beaten with leather straps. A group of the former students sued the state in 2010, but the case was dismissed because the statute of limitations had expired. Previous investigations and records had reported that 31 boys were buried on school grounds, and that most of them died in a fire and an influenza outbreak at the school in the early 1900s. But researchers at the University of South Florida, in Tampa, say they now estimate there are at least 50 grave shafts in the area of the school's cemetery and the surrounding woods. Some graves may have been the final resting place for more than one boy, the researchers said in an interim report released Monday. But that may be only the tip of the iceberg: The researchers didn't have access to student records after 1960, when such documents became subject to privacy laws. Moreover, researchers couldn't test the entire area because of overgrowth and vegetative conditions, they said. And more chillingly, there may be other, secret graveyards somewhere on the grounds, given the number of still-unaccounted-for cases and the practice of segregating cemeteries during the first half of the last century, Erin Kimmerle, an assistant professor of anthropology at the university, said on a conference call with reporters. It's highly unlikely that white boys were buried with black boys during those decades, but as yet, the researchers haven't found a previously hidden whites-only cemetery. "I didn't realize going in how much of a story of civil rights it was," Kimmerle said. The research team used ground-penetrating radar and other methods to map the school's cemetery and chemically analyzed the soil to identify the number of graves. "We anticipated finding about 25 to 30 grave shafts," said Christian Wells, an assistant professor of anthropology who led the anthropological work at the site, "but in fact we found a minimum of 50" — all of them on the north side of the campus, called Boot Hill, where African-American boys were segregated. A full picture of the sheer scale of the abuses remains difficult to paint, because there are significant gaps and discrepancies in the records, "and the cause and manner of death for the majority of cases are unknown," the report said. "Many questions persist about who is buried at the school and the circumstances surrounding their deaths," the report said. But Kimmerle said the team had determined that at least 20 boys died within the first three months of having been remanded to the school's custody — probably because they were unable to cope with the crowding and the conditions — and that burial locations were unspecified for nearly three times more African-American boys than for white boys. 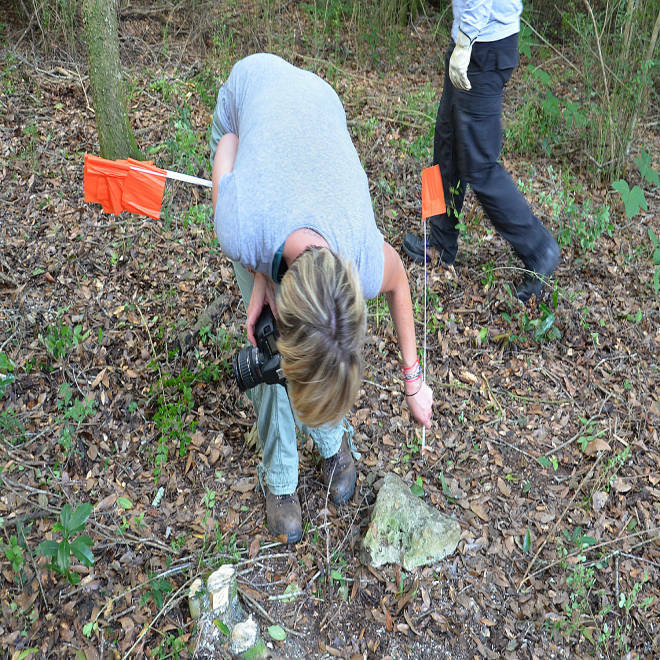 Anthropologists from the University of South Florida marked previously undiscovered graves at the Arthur G. Dozier School for Boys in Marianna, Fla., during field work in May 2012.